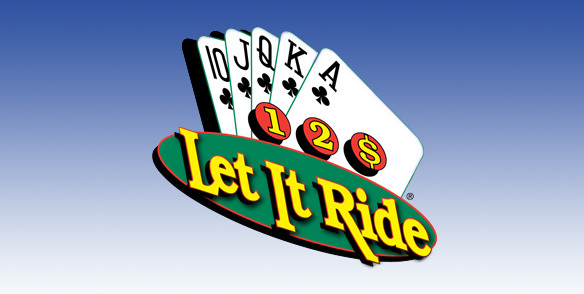 Most Let it Ride tables have a £10 minimum, with exception to a special promotion. There are 3 circles where your initial bet can be placed. You must put £10 in each of the circles in order to start playing. In addition, you also have the opportunity to play the progressive, which is £1 each round. Each player is dealt 3 cards, and two additional cards are placed face down in front of the dealer. These cards are a part of your overall hand. During the 1st round, the dealer will ask whether or not you want to pull your first bet back (after seeing your 3 cards), or keep it there. The 2nd round the dealer will flip one of their face down cards, face-up. Then they will go around the table and see if you want to pull back your 2nd bet, or keep it there. Finally, the dealer will turn their final card face-up, and then check each players hand to see who has won. You must have 10s or better to win even money on your bets. If you already have it in your hand (before you see the dealer’s two cards), then you always want to stay on all 3 bets. There is never a worry of the dealer beating your hand, which makes this game quite easy to play. However, it’s not easy to get dealt a pair of 10s or better from the start. If you have a 2,4,9 in your hand, the chances of you losing the round have greatly increased. After all, in this scenario, the only way to win now is if the dealer flips over both cards and they are 10/10, J/J, Q/Q, K/K, or A/A.